Apple's first foray into original TV content, "Planet of the Apps," starts Tuesday night, with the first of ten episodes being made available for global streaming on Apple Music and iTunes at 9 p.m. Pacific. The hotly anticipated debut comes nearly four months after SVP of Internet and Software Services Eddy Cue revealed a trailer for the show, saying it would launch in spring 2017. 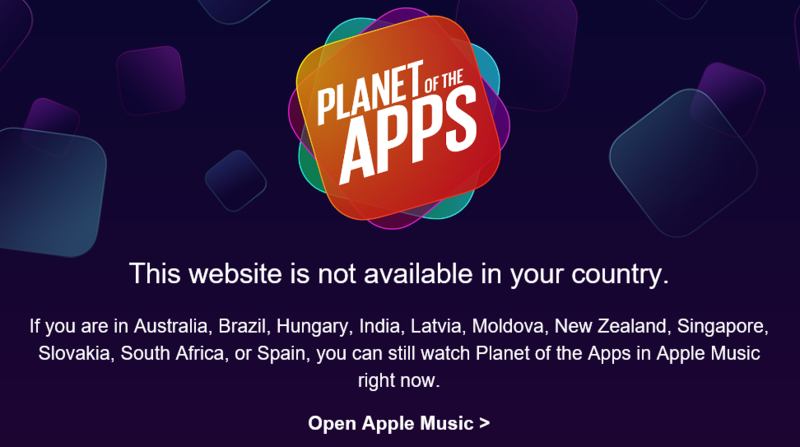 According to Reuters, the first "Planet of the Apps" episode can be viewed by anyone through iTunes or the show's website. A new episode will be released every Tuesday, with viewership restricted to Apple Music subscribers starting next week. The series is reminiscent of popular reality shows like "Shark Tank," in which independent developers from around the world pitch their ideas, in this case apps, to a panel of high-profile "mentors." Jessica Alba, Will.i.am, Gwyneth Paltrow and Gary Vaynerchuck make up Apple's cast, while Apple Music DJ Zane Lowe makes an appearance as the show's emcee. "The question when you have ideas is how to take those to fruition," Cue told Reuters. "Sometimes you may not know how, you might be afraid of what's involved. This really shows how that's possible." On "Planet of the Apps," contestants 60 seconds to sell mentors in an "escalator pitch" that has them literally explaining their app idea as they ride down an escalator. Once at the bottom, panelists swipe left or right on an iPad to show their interest, or disinterest, in the developer. Mentors then work with selected contestants to refine their product in preparation of a pitch in front of Lightspeed Venture Partners, which is putting up more than $10 million to fund the winning app. The first two episodes show developers peddling ideas for online shopping campus safety and school backpack apps, the report says. Since "Apps" is being streamed through Apple's music service, users are able to download apps featured in the show from the App Store. "Apps" has been in production since late last year and is the first of two original programs created for distribution on the Apple Music platform. The second show, an adaptation of James Corden's hit "Carpool Karaoke" segment, missed an April launch date but is expected to debut later this year. Apple screened a viewing of the pilot "Apps" episode at WWDC on Tuesday and will soon launch an advertising campaign on iTunes and the Apple.com home page. So, Apple's first foray into original TV content will not be available on Apple TV? Why not? I've got full Apple Music access on my Apple TV. The iTunes availability means it can be "purchased" and viewed on the ATV as well. "Planet of the Apps will be marketed heavily, according to Cue. The show will be advertised on the Apple.com homepage, in iTunes, and various other places. “All of our customers are going to be exposed to this in one way or another,” Cue said. A Twitter account with the “Planet of the Apps” handle has also gone live this evening, but it’s not clear if it’s the real deal or not." nothing on apple.com either...so far i have not been "exposed to this one way or another"
I can't even find it in Apple Music and the TV app..it's like Apple is embarrassed about it. Apple showed a screening of the pilot at WWDC to an audience of developers. It look like everyone sat through it, and enjoyed it. People were laughing at funny parts (and some of the titles explaining what B2B and SKD mean. The drama of Reality TV was just what you'd expect, but (speaking as a non-fan of TV and especially hyper-dramatized Reality TV shows) it was fun to watch and held my attention. It actually is even fun to see stories unfold. It's about app development and business, not personal drama and fighting. The website for the show seems to have changed. When I click on the link it takes me to a page in Apple Music that says the show is coming soon... Anyone in the US able to open it and see something different? They've added a TV & Movies section to the Apple Music app now. I can access the show page on my iPhone now but still can't play the video yet. Good to finally see the Movies & TV section though. There's not much in there yet but I'm sure it will grow over time. The first episode is available here in Australia now. Still nothing to promo the release within the app like promo banners or anything though. Apple believes that app developers are the next rock stats. It'll be interesting to see how this plays out. I haven't seen anything that suggests that app developers are the next rock stars. This seems like any other of the reality talent shows, but this one is geared toward making the younger generation more interested in how app development works. Ergo, this could help create more developers at a younger age, which is good for Apple, either as 3rd-party devs or working for them. The same goes for Car Karaoke. It helps promote artists and albums which helps promote Apple Music. Even Planet of the Apps is free if you subscribe to Apple Music. Hotly anticipated? That's a stretch. I'm in the UK. The show is available in the browse tab of the Apple Music app. Sorry to be negative but there is a large part of the Apple customer base that could not care less about this sort of thing. If Apple want to create shows then they could at least make them with something for everyone. Then when you get established, something like this would not get the coverage. If this is a flop then could it be game over for Apple in this area? I think it could. Don't you think all the haters are hotly anticipating their chance to rant and critique Apple? I'm sure half of them already are already written before viewing the first episode. Watched it and it was fine. Like any major network reality tv production values. But some of the rejected app proposals really felt like the show writers made them up to fill in time. Some really stupid ideas. Also the VC investor part felt like another show tacked on. They didn’t talk enough about the business models so the one chosen felt like they were already picked long before their escalator pitch. I’ll watch next week just to see how the show works but it doesn’t look like it’s serialized like modern streaming TV so there’s no cliffhangers or storylines to keep me interested. One cool thing is that every app featured is already on the App Store. It’s a little confusing because it’s not clear how long ago they shot the episodes. I suspect that the reason the show was pushed back from its original release date was not because the show wasn’t quite ready but because the apps aren’t quite ready. The whole show is really just a soft sell for the App Store. Not a terrible thing but then make it worthwhile TV if it’s just one giant commercial. Hate to break it to you Dan but it was quite a typical reality TV show viewing experience.